RVs and the RVing community have changed over the years and we strive to keep pace with these changes. A large indoor RV showroom, fully stocked universal RV parts and accessories department, and ten drive-through RV service bays cater to these needs while our expansive lot showcases the large inventory of new and used RV models. 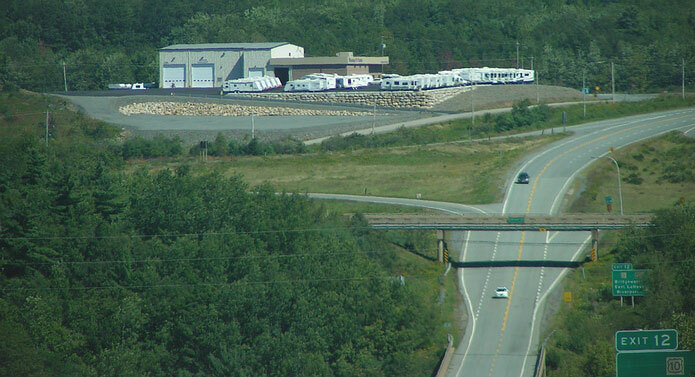 We offer Class A, B and C Motorhomes, travel trailers, fifth wheels, and destination trailers. We have something for everyone at Bluenose RV! We have over 115 of the most popular floorplans to choose from, in fact, over $8 million dollars in RV inventory - all lined up, open and ready for you and your family to join us and find the perfect RV to meet your needs and your budget. In fact we offer the Best Price Guarantee! Whatever you need for your camping adventure, you've come to the right place. We also have a mobile service van to come to you in your hour of need. On-the-spot RV financing is just another of the many conveniences we offer to make owning an RV both easy and affordable. These facilities combined with our experienced team makes for a winning combination! 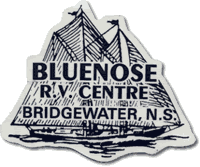 The name Bluenose comes from a famous Nova Scotia sailing vessel launched in 1921. She found fame by dominating the International Fishermen's races of her era. Undefeated, she earned the title "Queen of the Atlantic" and has been immortalized on the Canadian dime since 1927. The skills, teamwork, and integrity that made Bluenose famous is something we do our best to live up to.